Özlem Onaran* gave this interview to Anastasia Giamali of Avgi (The Dawn), Syriza’s daily paper. -Erdogan has been promoting a fully neoliberal agenda with privatisations, “development”, etc. Has this reached a ceiling? Is this the reason why people are protesting? Yes, absolutely. The obvious injustice and police brutality in Gezi Park was the last drop in a long process of accumulation of discontent against an authoritarian government, their social policies pushing for a conservative Islamic life style threatening in particular women and youth, criminalization and imprisoning of oppositional groups ranging from seculars to Kurds, socialists, and trade unionists, and neoliberal policies which increasingly commercialized public services, created areas of rent for large corporations, and eroded the living standards and security of a significant part of the working people. 27 May and the mobilisations that has followed will mark a historic moment for the collective memory of the movements in Turkey. This has been the insurrection of a new generation, who has been brought up by the conservative neoliberal authoritarian AKP regime for a decade. -The establishment has been presenting Turkey as model not only for the Muslim world but also as an economic model for Europe during the crisis. Is Turkey really a model? Can authoritarianism be a model? Not a stable one, as the recent events have shown. Can neoliberal speculation and finance-led growth be a model of development, social cohesion and regional convergence? No, as the recent history of Turkey, which is marked by regular boom and bust cycles, and crises in 1994, 2001, 2009, shows. In the recent global crisis, Turkey had one of the severest recessions in 2009 –deeper than other major emerging economies. Indeed Turkey’s growth model dependent on cheap labour and speculative financial capital inflows and a high trade deficit, would have experienced a crisis sooner or later even without the global recession. The recovery since 2009 is as fragile as before. The share of industry in Turkey’s production is decreasing and becoming increasingly more dependent on the imports of intermediate and capital goods. No wonder, this is a jobless growth process with high youth unemployment rates reaching 22%. This is neither socially nor economically stable. AKP has recently took pride in having paid the last instalment of its debt to the IMF. However, in the last decade Turkey has borrowed increasingly more in the international financial markets, and in particular the foreign debt of the private sector has reached unforeseen levels. This is a fragile model. When the private debtors go bankrupt, those private losses are often socialized. The periphery of Europe is just one recent example of this to add to a series of former crises in Latin America and East Asia. The next bust and crisis in Turkey is not a question of “if” but “when”, and the international financial investors will make that decision. -We have come to conclude that the tone of the protest is not being set by the poor or the working classes but by the demand for democracy and social freedom. Is it possible to combine these two? They have been already combined. The Confederation of Public Workers’ Unions has rescheduled its strike about a change in the labour law to 4-5 June in order to support the mobilization. What brought discontent to the tipping point of rebellion is also the increasing insecurity and impoverisation of the working people in Turkey. AKP has initiated a redistribution towards the poorest of the society via both crony in kind transfers of food and fuel as well as some institutional pro-poor changes, e.g. in the health services. However, the source of this redistribution was income scrapped from the organized blue collar and white-collar/professional working people, and not taxes on the rich. This redistribution helps to increase the profits of the large capitalists without hurting the poorest further. This also explains part of the mass electoral support for the party. In the last decade insecurity has increased for all segments of the working people bare the poorest. During a decade of AKP rule the amount of workers working for outsourced companies has more than tripled reaching to above 1.5 million. Almost a thousand workers died in workplace accidents. Dr. Ahmet Tellioglu, a workplace doctor at a major factory in Istanbul, who has been sacked recently because of his objection to serious health hazards in the practices of the factory, says that “anyone who is just above the poorest or earning just above the minimum wage, thus any working person, who has something to loose, feels increasingly more insecure in Turkey today”. -According to the protesters the Turkish government is building shopping centers and malls all over the country and that’s what she is attempting to do in Gezi Park. They also say that these shopping centers will mark the end of the small shops and itinerant trade. Are we moving towards the creation of a new proletariat? Yes, the losers of these policies are multi-dimensional. Gentrification and commercialization is generating a potential for new urban alliances across different segments of the society ranging from the dislocated Roma people and the Kurdish street vendors to organized workers and small shop owners. Some of the latter may have voted for AKP but the neoliberal policies as well as the sheer arrogance of their brutality and ignorance about any popular discontent may mark the beginning of the erosion of the diverse mass support for them. -The past two years, we have seen uprisings everywhere, from Wall Street to Tunisia with most recent ones in Sweden and the current uprising in Turkey. Do these movements/uprisings have anything in common apart from police brutality? They have a lot in common. They are all a rebellion against the lack of democracy, voice, and representation as well as rising inequality, joblessness, insecurity, commercialization of the supply of basic needs and the multiple dimensions of the crisis -the energy crisis, climate change, ecological crisis and food crisis. Young men and women, who are mostly not coming from former organized leftist backgrounds, have been in the forefront of all these mobilizations. Not surprisingly, this is happening at a time of record high youth unemployment and increasing precariousness. This is a new generation, who feels insecure about the future, working, if at all, with fixed/short-term contracts, or part time without a choice, at times in the informal sector, most often for low pay, and usually in jobs not matching their education levels and aspirations. These mobilizations have given a massive expression to the discontent of a silent majority across the world and turned hopelessness into first anger and then hope. Their experiences has been followed and received by solidarity across the world. They have created domino effects, first regionally, but I believe now it is fair to say, also internationally. 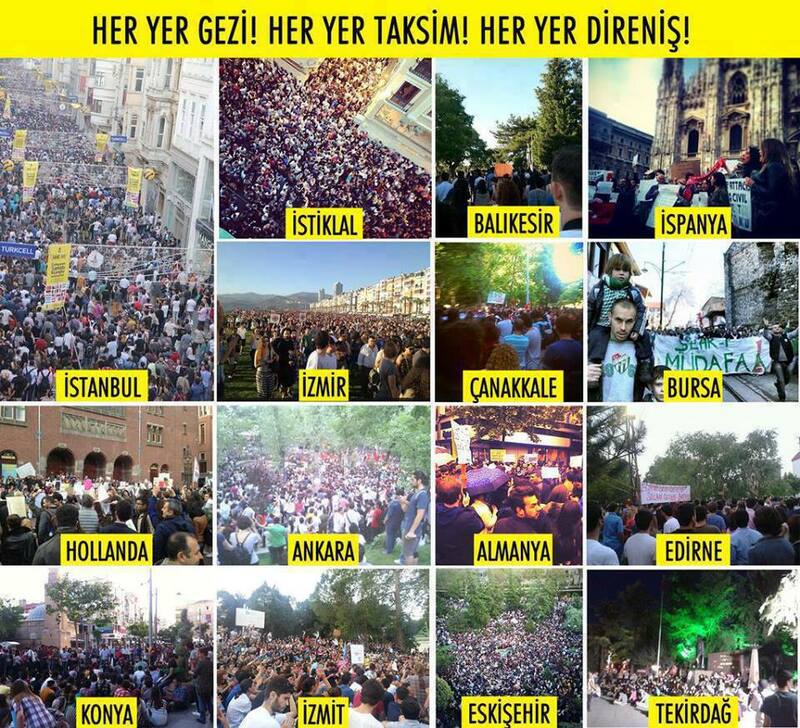 Turkey has a long tradition of rebellion, but I feel the recent images of rebellion from Greece or Spain or Egypt has been more alive in the memory of the first time demonstrators in Istanbul, Ankara or Izmir than the history of Turkey which has been persistently erased or discredited or demonized in the collective memory of the young Turkish people by the military coup and generations of ruling elite to follow. To occupy and demonstrate is now almost the new fashionable and “hip” thing in a positive sense. To overcome fear and to rebel is something to be proud of. It is a uniting feeling as hearing the song from the concert of your favourite band playing at a remote corner of the world. No matter what next, all these mobilizations have transformed our social genes forever. *Özlem Onaran is a Turkish economist living in London.